JJ Rhatigan & Company have just started work on the Gardens International Office Development project in Limerick, the first Limerick Twenty Thirty contract. The 100,000 sq. ft. office development is the first of three major projects that will transform inner city Limerick, creating 1.4 million sq. ft. of prime real estate for various uses. The contract, valued at €17.6 million, is due to be completed late 2018 and will support 150 jobs during construction. Limerick Twenty Thirty Chairman, Denis Brosnan, noted that this project is “very important for Limerick and the wider region”. This will be the catalyst for a new era of growth for Limerick as this is the first in a wider programme that is going to transform Limerick into a dynamic living and working city capable of competing with the leading destinations in Europe for inward investment. 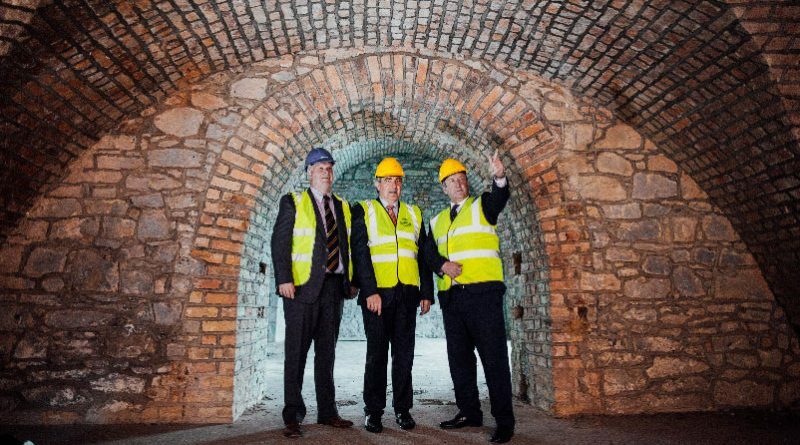 “It’s also timely from a Brexit perspective as Limerick, with high-end projects like this, will be the best place and most competitive English speaking city in the EU for inward investment. We will have state-of-the-art space in a city that has been revitalised over the last three years or so but remains an extremely cost-effective location for operating international business in and from.” he said. James Godley, Regional Manager Munster, JJ Rhatigan & Company noted “our company specialises in conservation work and this is very impactful for us. As an office development, the first people who will walk through this door looking at the finished product will see a historic building tied to a new structure which in itself is very rare”. The five-storey development will be suitable for a range of uses and will be Limerick’s first city centre LEED Gold certified office scheme. It has been designed to a high spec, with a modern office feel dovetailing and entirely complementing the aesthetics of an architecturally significant building considered one of Limerick’s most unique. The building will be completed with a structural glazed façade to provide a high level of environmental control within the office space, minimizing solar gain and reducing imposed air-handling energy requirements. It also includes automated fully glazed entrance doors, natural stone flooring, a turnstile security system, car parking space, cycle bays and other services.